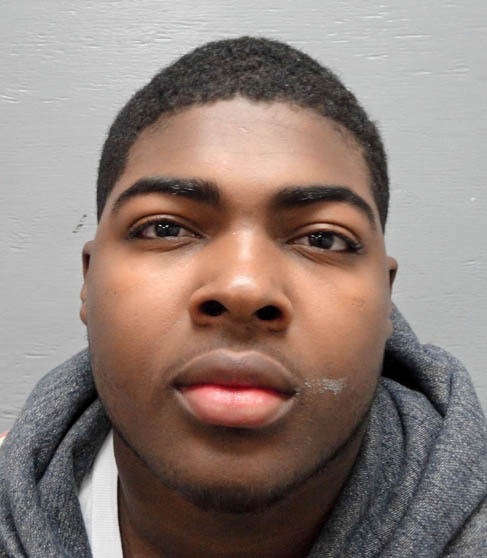 Eimel E. Evans, 19, wanted by the New York City Police Department on charges of attempted murder, firearm possession, assault and gang assault, was arrested in Waterville on Monday. WATERVILLE — Police on Monday arrested a Thomas College student who is wanted in New York City on charges that include attempted murder. The student, Eimel E. Evans, 19, of New York City, who also attended high school in Augusta last year, was arrested about 8:30 a.m. on the college campus, according to a news release from Waterville Deputy Chief Charles Rumsey. The charges against Evans stem from a shooting in New York City in August 2012. The other charges he faces are being a fugitive from justice, criminal firearm possession, first-degree assault and gang assault. Jennifer Buker, director of public relations at Thomas College, said Evans is a freshman enrolled in business management. Evans has been suspended from the college because of his arrest Monday, she said. Buker said Evans is not an official member of any team or group at the college. She said Thomas College security was notified that police would be entering Evans’ dormitory Monday morning. She said she did not know which dormitory he was living in. Evans, who shows a Fifth Avenue address in New York City, graduated in 2012 from Augusta’s Cony High School, according to Morning Sentinel archives. He also played defensive line in football and forward in basketball for the Rams, standing 6 feet, 4 inches and weighing 270 pounds. Cony High School football coach Robby Vashon said Cony had Evans on the team for just one year after he had transferred from a school in New York. Vashon said Evans seemed to fit in well in school and with the other players on the squad. Officer Sophia Tassy, a spokeswoman for the office of New York Police Department’s deputy commissioner of public information, said Evans was one of five men who allegedly beat another man to the ground. The man was then shot multiple times by one of five, she said, which resulted in the attempted murder charge. The victim survived, she said. The incident took place at night at the corner of St. Nicholas Avenue and West 114th Street in Manhattan’s 28th precinct, Tassy said. The motive may have been gang related, she said. “I don’t have a gang name, but the reason there’s a charge of gang assault is whenever more than three people are involved in this type of incident, it’s called a gang assault — it’s a gang of people,” she said. All of the charges are felonies, she said. Members of the Waterville Police Department assisted several New York police department detectives Monday after those detectives traveled to Maine during the weekend to apprehend Evans, Rumsey said. Evans did not resist arrest Monday morning and was cooperative with the booking process, according to Rumsey. Rumsey said when someone is arrested in Maine on charges stemming from alleged crimes in another state, the person is charged with being a fugitive from justice. That charge allows Maine law enforcement to take people into custody so they can be held pending an extradition hearing. Evans was taken to the Kennebec County jail in Augusta where he was being held without bail pending extradition to face charges in New York. Cony High School Principal Kimberly Silsby and Assistant Principal Stewart Brittner did not return calls Monday for comment.